The most simple method and Budgetextension of living space, the unit can be called a mansard roof of a private house. All the works do not require special construction techniques and can be executed with their hands, although it should be borne in mind that this process is quite time-consuming. However, the effort pays off well, because in the attic can be arranged not only the gym or winter garden, and living rooms - enough to hold a simple work on its insulation. In order to simplify and accelerate devicesloping mansard roof with his hands, should take care of the creation of a detailed and competent project. 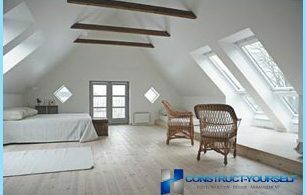 This will avoid many difficulties and increased costs during the construction phase of the attic. 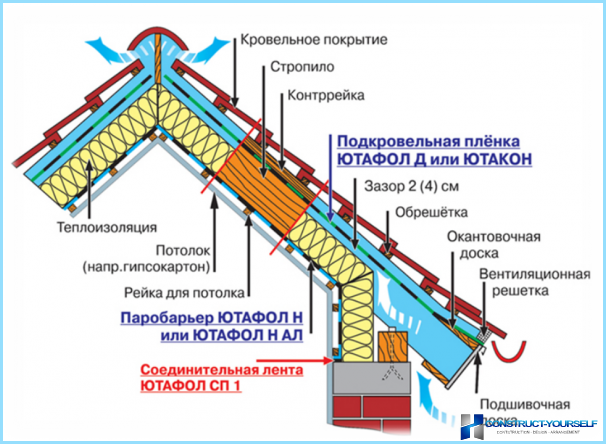 the need for insulation of the attic and its heating. Regardless of what form of plannedarrange the roof (single / multi-level, gable / scrap), designing the best ever fully trust the specialist or to perform independently, but under his leadership. Proper installation of the support structure isguarantee that all of the attic design will be reliable and will withstand not only its own weight but also any external influences - wind, rains and heavy snowfalls. Therefore, the device mansard roof rafters should be carried out taking into account the climate zone in which the building is located. The optimal material for the rafters for the mansard roof, has traditionally been considered softwood (pine or larch). Important! 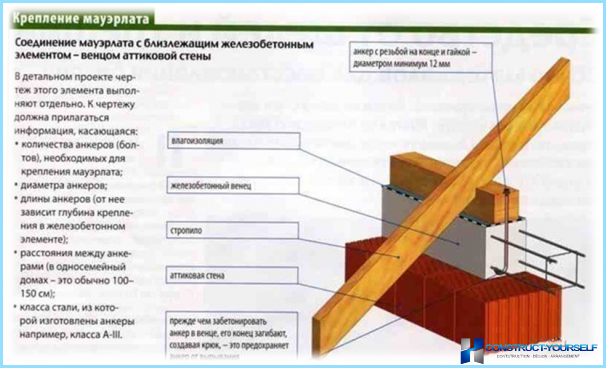 Humidity timber used should not exceed 22%, otherwise possible deformation of the structure during drying. After dismantling of the old roof, you can start mauerlat device mansard roof, which is a kind of "foundation". Mauerlat mounted on two oppositewalls in the case being built roof is gabled, and on the perimeter, if you plan hipped roof. Particular attention should be pointed at the fact that all elements mauerlat should be located in one plane and be parallel, and the angle between the adjacent parts of it must be exactly 90 degrees. It is also necessary to provide sealing between the presence and proper supporting wall mauerlat, and he must be made from a single timber, with a minimum number of knots. Before starting the installation of the rafters atticroof, they must be treated with special ognebiozaschitnym composition, which protects wood against rot and insect infestation, making it readily ignite. The optimum method is impregnation, soaking, but in failing to treat the rafter in a similar way, the composition can be applied by brush in several layers with intermediate drying (1-2 hours / layer). Regardless of the size of the room of the future.device mansard roof truss system is quite time consuming, so it is more expedient to carry out the assembly of wooden trusses on the ground, and have assembled to carry out their recovery and fixation. Initially carried out the installation of the two extreme farms between which pull the ridge (level). This will create a perfectly flat structure. Step fixing rafters must not exceed 100-120cm. After the installation, the farm fastened together with special bolts, which provide the necessary rigidity of the attic and at the same time serve as a basis for the future of the ceiling inside the room. 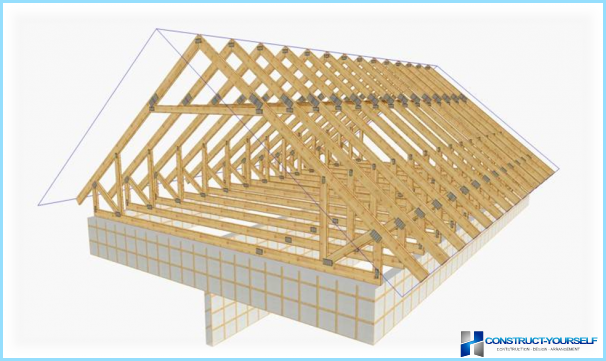 If you plan device dormer windows in the roof, at the same stage in the truss design provides the appropriate openings. 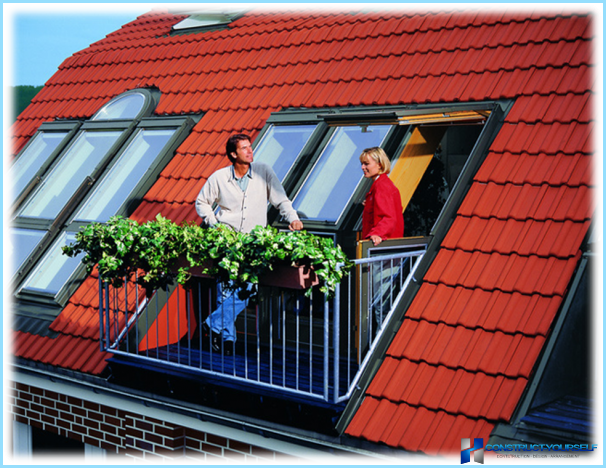 Recommended glass area of ​​the attic floor is 12.5%. The angle of inclination of the rafters may varyranging from 30 to 60 degrees. When you select it should also take into account the climatic features of the area where the house is located. In the case of building in place steppe climate prevails and windy weather, the tilt angle can be reduced, thereby increasing the area of ​​the dwelling. If the house is built in a forested area, the tilt angle must be increased, which will contribute to an easier descent of snow with a mansard roof in winter. Separate device gable mansardroof involves quite a difficult choice of type of roof covering. 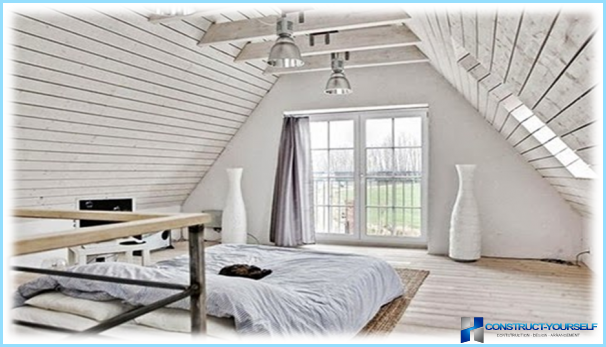 Since the construction of the attic is not desirable to burden too heavy coating, the use of natural tile as the most practical and durable material, is practically impossible. It is also desirable to use metal roofing - primarily because of its low heat and sound insulation characteristics. Therefore, the most common materials are considered to be traditional slate or flexible (asphalt) shingles. It shingles can be considered the mostbest material for the mansard roof, combining high aesthetic characteristics, reasonable cost, easy installation and good insulating properties. For its installation should provide a solid crate. An excellent material for it becomes OSB-plate (3 classes). If you select slate or other sheet material is sparse enough crates from edging boards fixed on the rafters with a pitch of 25-50 cm. It should be noted that regardless of the type of roofing, mansard roof with his hands the device must be accompanied by its insulation. Typically, the device mansard roof, a photo of which is shown below, it is a multi-layered. 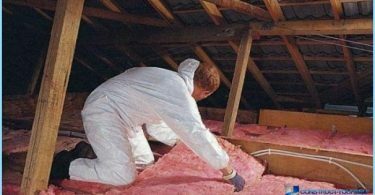 At the same time, the quality of insulation of the attic should besufficient to ensure the normal temperature inside the new room without significantly increasing the cost of heating. As the heater best use of non-combustible (basalt) rock wool. It is available in rolls or mats to a thickness of 50-100 mm. For the middle zone of our country, recommended by a layer of not less than 200 mm. Important! 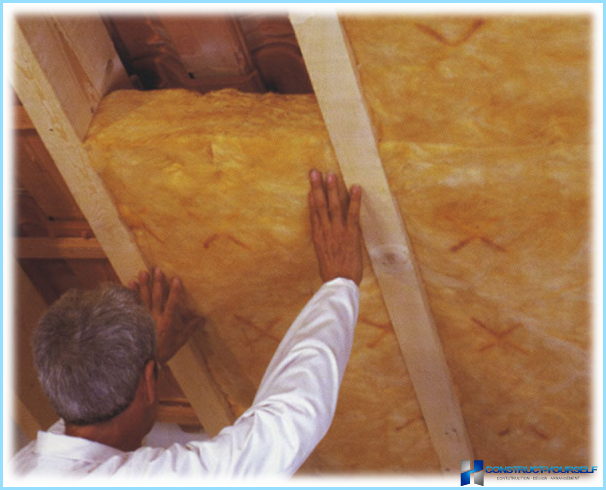 Through the device mansard roof of a wooden house with any fibrous insulation, you need to take care of a reliable vapor barrier - for this special membrane applied. the inner layer, in a role which can act drywall, OSB plates, wooden or plastic linings. The device mansard roof with his hands, a video of which is presented below, demonstrates all stages of work. Despite sufficient complexity, yet it is not something impossible. To perform the work does not require the involvementheavy construction equipment or expensive professional tools. Demonstrating device mansard roof, the video will help avoid common mistakes in self-construction, and several times to speed up the whole process.